Long before Arnold Barboza Jr. was scheduled to face Mike Alvarado, he was a fan of the former junior welterweight champion. Barboza was in the stands at Dignity Health Sports Park when Alvarado and Brandon Rios went to war for their first of three fights in 2012. Despite Alvarado suffering his first career defeat, Barboza, then a 20-year-old amateur boxer, admired Alvarado’s determination throughout the seven-round slugfest. A year later, Barboza turned pro and became Alvarado’s sparring partner and helped him train for the Ruslan Provodnikov fight. 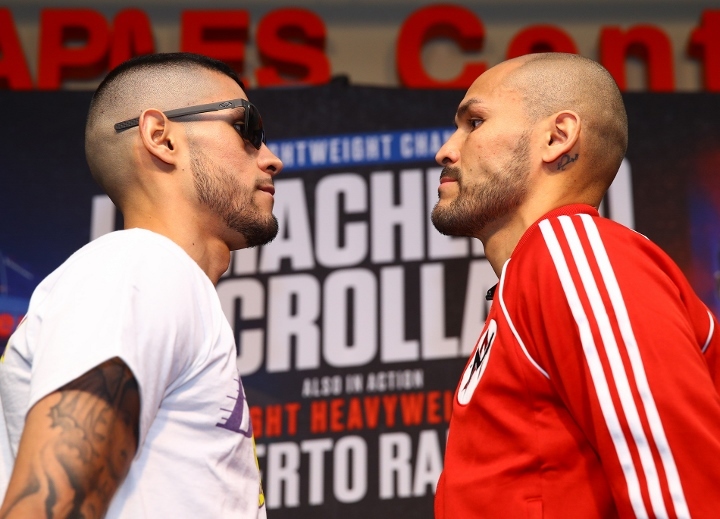 Barboza (20-0, 7 knockouts) and Alvarado (40-4, 28 KOs) will clash for a 10-round junior welterweight bout on the Vasiliy Lomachenko-Anthony Crolla undercard on Friday at Staples Center in Los Angeles. The undercard is slated to stream on ESPN+ at 8 p.m. EST/5 p.m. PST. Barboza, one of the top prospects in the 140-pound division, said he hasn’t spoken to Alvarado leading up to the fight, but the two shook hands at the media workout on Tuesday. On many occasions, friends avoid fighting each other, but the two share the same goal of becoming a world champion, and the winner could be first in line to face WBC champion Jose Ramirez. It’s been six years since Alvarado won the interim WBO junior welterweight title after defeating Rios in the rematch. He lost the following fight to begin a string of three consecutive losses against Provodnikov, Juan Manuel Marquez and Rios. After the setbacks, Alvarado went on a 14-month layoff to battle an alcohol addiction and other personal demons. Now at age 38, Alvarado is on a six-fight winning streak and in search of another title reign. He doesn’t want to be remembered as the exciting fighter who came up short during the biggest fights. Alvarado said he’s in a good place in life and it will remain that way regardless of the outcome on Friday. “If (Barboza) happens to get by me, he deserves it,” Alvarado said. “I’ll say it because I know how hard I’ve been working, how much passion I have, how much change I made for me to be at that next level.